(Please view a print version here). This discovery is all the more important because two crucial moments which may have a huge global impact on biosafety are to take place shortly. From 2 – 13 July 2018, experts from the 196 countries that have signed this international agreement will gather in Montreal to continue discussions on controversial technologies such as Synthetic Biology and so-called gene drives made through gene editing. And on 25 July 2018 the European Court of Justice (ECJ) will publish a ruling about the legal status of new genetic engineering techniques including gene editing. The files which inform the present article were released on 18 May 2018 by the Dutch Ministry of Health, Welfare and Sport following a Freedom of Information request directed to one of its officials by Corporate Europe Observatory. Parts of these documents were censored by the Ministry prior to their release: all the names of people involved were redacted, on “privacy” grounds, as well as parts of the content, claiming that disclosure would be “unreasonably disadvantageous” to the people involved because it concerned sensitive information on negotiation positions, and could lead to “reputational damage” and exposure. Other batches of files used for this article (the ‘Gene Drive Files’) were released by the Texas A&M University and the North Carolina State University in August and October 2017 following Freedom of Information requests by Edward Hammond/Third World Network, and by the Canadian Food Inspection Agency following a request from the ETC Group (a group which monitors the impact of emerging technologies and corporate strategies on biodiversity, agriculture and human rights) in 2016. The Gene Drive Files include emails that do reveal the names of people involved. Gene editing - refers to a set of techniques like CRISPR-Cas and Talens. Most gene editing techniques use enzymes to "cut" parts of the genome. The genome then "repairs" itself. The documents show how the lobbyists’ interest – and their collaboration with ‘like-minded’ regulators - was focussed on two key strands of work undertaken within the CBD and the Cartagena Protocol: (1) the production of a Guidance document (referred to in short as a Guidance henceforth) on GMO risk assessment and (2) discussions on new and extreme genetic engineering techniques: Synthetic Biology or SynBio, gene editing and gene drives. Angelika Hilbeck, of the Swiss Federal Institute of Technology and board member of the European Network of Scientists for Social and Environmental Responsibility (ENSSER), who is involved in scientific capacity building in the Cartagena processes, explains that the norms agreed at the UN level are consensual and are therefore minimum standards by default. As Third World Network (TWN), an organisation closely following these UN processes, has explained, the UN Guidance for risk assessment is a central pillar of the Protocol. An adequate, thorough and informed risk assessment is the key tool which supports countries to take decisions on whether or not to import GMOs. However numerous attempts have been made to delay and derail the endorsement of the Guidance by countries with strong biotechnology and trade interests. These countries “have effectively blocked endorsement of the Guidance, and have continually insisted on having it reviewed and tested”, according to TWN. This view is supported by Angelika Hilbeck, who reported in 2015 in the Journal of Health Education Research & Development that the GM risk assessment work done under the Cartagena Protocol had been under attack for a number of years by business-friendly delegations. “Statements by a handful of Parties in line with counseling non-Parties discrediting the scientific basis of the Guidance without any scientific justification could repeatedly block progress [..] with no sign of ever being willing to accept any Guidance document other than its abolishment”. These delegations seemed to be opposed to having any UN Guidance on biosafety in place, despite many believing it to be necessary to avoid negative impacts on biodiversity and food safety, and in spite of the fact that it is in any case a voluntary document that Parties are not obliged to use. But things would get even worse. At the 2016 Conference of the Parties (CoP) in Cancún, the country delegations which opposed, obstructed and blocked the UN Guidance also helped to bring about the shut-down of the UN working group (the Ad Hoc Technical Expert Group, AHTEG in UN jargon) responsible for this Guidance, causing years of delay in future work on risk assessment. This same working group (AHTEG) was also responsible for setting priorities for further guidance for special topics like SynBio. At the previous Conference of the Parties (COP) in 2014, it had been decided that an AHTEG on Synthetic Biology would be established to further discussions on the topic. These discussions on SynBio also address a new and highly controversial application of new genetic engineering techniques: gene drives. Gene drives, as explained by the ETC Group, are designed to force a particular genetically engineered trait to spread through an entire wild population – potentially even causing deliberate extinctions. Ahead of the Cancún conference in 2016, a call signed by over 160 organisations worldwide demanded a global moratorium on gene drives, as the new technology could pose “serious and potentially irreversible threats to biodiversity, as well as national sovereignty, peace and food security”. PRRI: public researchers or industry interests? Established in 2004, PRRI’s stated aim is to involve the public research sector in regulations on biotechnology, but as Corporate Europe Observatory reported in a 2008 briefing, it is striking that the group consistently advocates views that are distinctly in line with those of the biotech industry. The focus of the group has primarily been on UN biosafety processes (CBD, Cartagena Protocol and Nagoya Protocol), but it has also organised events with biotech lobby group EuropaBio at the EU level. PRRI’s founder, Piet Van der Meer, previously worked as a Dutch official involved in negotiating the Biosafety Protocol and in UN biosafety training projects. However, in both roles he was criticised for his bias in favour of industry-friendly views. Van der Meer subsequently left his regulator role and founded the lobby group PRRI. Since its foundation, PRRI initially received funding from industry, including CropLife International, Monsanto, the International Service for the Acquisition of Agribiotech Applications (ISAAA) and the Syngenta Foundation; and later from several governments and EU-funded projects. However, PRRI does not mention any funding sources beyond 2012 on its website, and has not responded to Corporate Europe Observatory’s enquiry in this regard. Based in Belgium at the Flemish Biotechnology Institute (VIB), PRRI has consistently aimed to lobby for industry-friendly policy outcomes without being seen as explicitly representing industry (the “third voice strategy”). Over the years they have, for instance, promoted sterile “Terminator Seeds” and GM trees, and have opposed increased public rights to be involved in decision-making on GMOs, and more recently the Guidance on risk assessment. Activities and tactics undertaken to influence the UN talks included interventions and side events to “counter misinformation”; “damage control” aimed at steering away from civil society calls for moratoriums on certain applications like terminator seeds or GM trees; encouraging other organisations to get registered to have “more voices expressing the same message”; and most recently the training and coordination of a large delegation of students to boost the number of pro-biotech voices. Over the years, PRRI began to team up with other like-minded organisations. These included the corporate-backed ISAAA (financed by Monsanto and Croplife International amongst others) to organise regional preparatory meetings for Cartagena Protocol talks, Target Malaria (a Gates-backed project aiming to use gene drives to eradicate mosquitoes) and the Cornell Alliance for Science (a Gates-backed project for biotech promotion). The documents show that PRRI has been running several “informal, like-minded”3 email groups on key issues which the CBD and Cartagena Protocol processes address, including environmental risk assessment, liability, and SynBio. During UN talks, Van der Meer told Louter, the PRRI network provides regulators with the services of a “’backup team’ who can give immediate feedback through email, or search for articles while you sleep”. Recipient list showing mix of industry and regulators. The Conference of the Parties of the UN CBD (‘COP13’) and the Cartagena Protocol in Cancún (‘COP-MOP8’) in 2016 was to be a decisive moment for the parties to these international agreements to agree on the endorsement of the risk assessment Guidance. Leading up to that, several online consultation rounds took place to inform COP-MOP8 decisions. Teaming up with ISAAA, PRRI also engaged in regional preparatory meetings to facilitate the participation of “scientists and stakeholders” in the UN biosafety process. The attack on the Guidance on risk assessment was in part prepared at a five-day closed meeting convened by Karin Hokanson of the University of Minnesota, who is part of PRRI’s email groups, and held in February 2016 at the headquarters of the International Life Sciences Institute (ILSI) in Washington DC.9 ILSI is a global lobby platform for the combined biotech, pesticides and food industries with members including Monsanto, Mondelez, Cargill and McDonald’s (see Corporate Europe Observatory’s briefing on ILSI). This meeting was organised specifically to “create some consensus” among a group of “like-minded” biosafety regulators about the Guidance on risk assessment.10 Officials listed as due to attend were from Argentina, Australia, Japan, Canada, Brazil, Colombia, Mexico, the Philippines and the USA (a non-party to the CBD and the Protocol). The Dutch representative Boet Glandorf is listed as representing the EU. Paraguay and South Africa were on the ‘to be confirmed’ list, indicating that PRRI considered them among the “like-minded” as well. As we will see further on, a number of these countries later successfully blocked the Guidance and shut down the AHTEG itself at COP-MOP8 in Cancún later that year. As the German NGO Testbiotech exposed, Yann Devos is the co-author of a 2018 scientific paper, together with a Syngenta employee and Karin Hokanson, on an issue which he was at the same time responsible for at the EFSA; he also sits on the Board of Directors of the International Society for Biosafety Research (ISBR), an organisation sponsored by Monsanto and Croplife among others, together with Monica Garcia-Alonso of Estel Consult. Representatives of ILSI, PRRI, the US Department of Agriculture (USDA) and a consultancy firm (Estel Consult) were on the Steering Committee for the meeting. PRRI’s Piet van der Meer is listed as “PRRI/University of Ghent”, however the university told Corporate Europe Observatory that these activities were not carried out in his university role of Guest Professor. 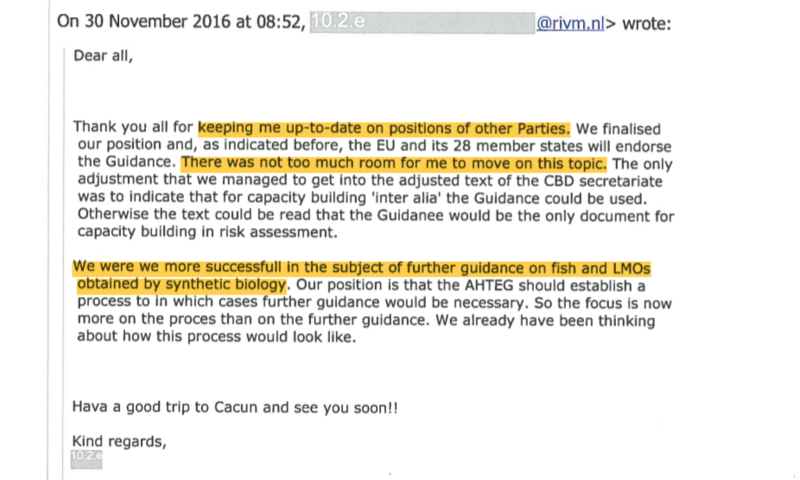 With the Cancún conference approaching, in October 2016 the EU member states were set to decide on the bloc’s endorsement of the UN Guidance on risk assessment and on the question of whether further guidance was needed for SynBio. Dutch official Boet Glandorf announced to PRRI’s email group that she had been appointed as the lead for the EU position, together with the UK and Sweden. In another email Glandorf shared her own inventory of the opinions of EU experts with the PRRI group.16 PRRI’s Van der Meer said he was “reassured” that she was to lead the EU position and sent her the position of the Global Industry Coalition (GIC), the biotech industry’s lobby platform at the UN CBD processes. Van der Meer’s wife is a former key lobbyist for the Global Industry Coalition in the CBD. The coalition’s secretariat is hosted by Croplife International in Brussels. Neither of these organisations are registered in the EU Transparency Register. Karin Hokanson of the University of Minnesota, who organised the Washington DC meeting, sent Glandorf intelligence on the positions of Brazil, Mexico, India and Japan, including contact details for delegates. Glandorf was also offered help by Monica Garcia-Alonso, a former Syngenta lobbyist for 18 years, who now runs the firm Estel Consult: “it looks like you have a difficult task ahead. I am happy to help you wherever you think I can”. She said the EU decision was motivated by a desire to “give a ‘positive’ signal” and that some member states thought the Guidance had improved. She added: “We are still collecting arguments why we are so positive :).” The PRRI group called the EU outcome “depressing”.23 However, Glandorf said she did manage to get the EU to withold support for the development of further guidance on GM fish and GMOs from SynBio – a not insignificant result. She placed the Group of Latin America and the Caribbean countries in four categories: those that were ‘science-based’, ‘precautionary’, ‘mixed’, or ‘silent’. In general however, she said, developing countries “will adopt whatever they see coming from the CBD and CPB by default.” She concluded: “I feel much is at stake for this COP-MOP”. The synthesis report states, for instance, that the risks and impacts of SynBio organisms should be assessed “prior to any introduction to the environment”, and that risks to human health and impacts on small scale farming and indigenous peoples should be taken into account. PRRI’s short comment on this provision was that “they’re trying to make [it] as onerous and time consuming as possible”. The UN online consultation on SynBio also addressed gene drives. There is a paramount need to look at the risks of gene drives, because of the potential quick and irreversible spread of a new trait in complete populations. Ahead of COP-MOP8 in Cancún, 160 environmental and social justice organisations world wide signed a call to the Convention for a global moratorium on the new technology, which they said posed “serious and potentially irreversible threats to biodiversity, as well as national sovereignty, peace and food security”. In the past a similar moratorium was adopted by the UN on ‘Terminator Technology’ producing sterile seeds (also called ‘Genetic Use Restriction Technologies’, GURTs) a decision that was celebrated by farmers’ and environmental movements. PRRI’s statements on terminator seeds at the time were fully aligned with those of industry groups and the USA, all of whom were in favour of GURTs. Files released following Freedom of Information requests by researcher Edward Hammond to two universities in the US revealed how lobby firm Emerging Ag was paid $1.6 million dollars by the Bill and Melinda Gates Foundation to try to skew the outcomes of CBD online consultations on SynBio and gene drives in favour of a less stringent approach. Emerging Ag covertly recruited over 60 seemingly independent scientists and officials to stack the online consultations with pro-biotech voices. The group of people involved in the coordination of this effort partly overlapped with the PRRI email group discussing the topic. The Emerging Ag operation involved three members of the previously mentioned UN expert group (AHTEG) on SynBio, two of whom represent institutions that received over $100 million dollars combined in U.S. military and philanthropic funds expressly to develop and test gene drive systems. The use of gene drives in bioweapons to drive extinctions has become a major security concern. Notes documenting a teleconference call of this network from June 2016 show that Emerging Ag and the J. Craig Venter Institute would approach the USDA to see if there were funding opportunities for PRRI to increase their ability to participate in online consultations. Following the release of the Gene Drive Files to the public, civil society organisations called on Dr. Cristiana Paşca Palmer, Executive Secretary of the Convention on Biological Diversity, to take urgent measures to address conflicts of interest in the CBD, its Protocols and subsidiary bodies. During the second week of UN meetings this July, the CBD Subsidiary Body on Implementation (SBI) meeting is expected to discuss the issue of conflicts of interest. 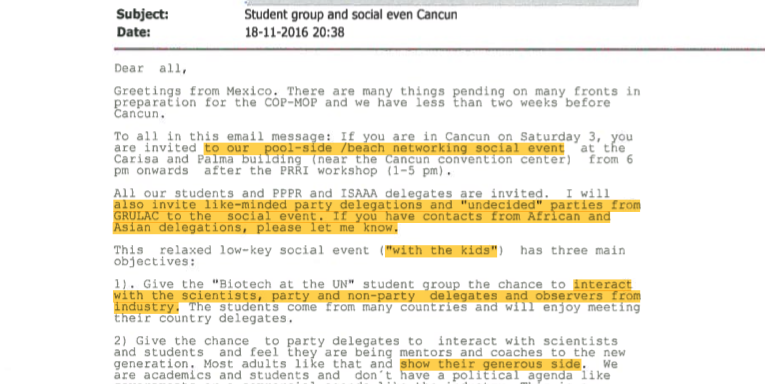 Van der Meer also mentioned that during the meetings in Cancún “communication experts of PRRI and the Cornell Alliance for Science will use Twitter and other social media” to report on what was happening. The Cornell Alliance for Science was set up with a $5.6 million grant from – once again - the Bill & Melinda Gates Foundation with the specific aim to “depolarize the charged debate around agricultural biotechnology and genetically modified organisms (GMOs)”. One day before the launch of the UN talks, PRRI and ISAAA jointly organised a preparatory meeting and a “pool-side/beach social event” for their delegates and lobbyists.37 Also invited to the social event were “like-minded” party delegations from countries like Mexico and Brazil, as well as “undecided” party delegations from Latin America, Africa and Asia. However, at the side events inside the official process, the students made an odd impression on a number of attendees. ENSSER board member Angelika Hilbeck observed that the students “came across as carefully rehearsed and even drilled” but also showed “clear signs of distress”.41 Some students even had emotional breakdowns in side events. After a few disruptive interventions, it was obvious that “they had the goal to derail the side events of groups who did not agree with their position on genetic engineering”, says Hilbeck. “They were encouraged in their disruptive behaviour by their professor Maria Mercedes Roca, the Honduran delegate. These tactics reveal a lack of respect of dissenting positions as well as democratic discourses and decision-making processes”. Halfway through the negotiations TWN reported “strident opposition to the Guidance as well as to the continuation of the AHTEG to develop further guidance on specific topics of risk assessment”. The issue of risk assessment pitted developing countries requesting guidance and support against many developed countries and some developing countries with biotechnology and trade interests. Brazil was part of the group leading the attack on the Guidance, complaining that the CBD Secretariat had published the Guidance as part of a so-called UN ‘technical series’ before it had been officially endorsed. While this is not an uncommon thing to do, Brazil accused the Secretariat of “violating their trust in the process”. The tone of the discussions were “unusually discourteous and antagonistic for UN negotiations”, wrote TWN. Angelika Hilbeck makes a similar observation about the side events: "There was an abysmal decline of debate style, which was unprecedented and inappropriate to the United Nations." “The use of emotion and aggression instead of rigorous science and a precautionary approach and the manipulation of enthusiastic students from the global south are simply not acceptable”, comments Helena Paul of Econexus. Christian Schwarzer of the Global Youth Biodiversity Network (GYBN), the official coordination platform for youth participation in the CBD, confirms that the members of GYBN's delegation too encountered "harassment and vocal attacks from PRRI-students, who said that our approach to uphold the precautionary principle would be detrimental to technological progress and human wellbeing". "In general, our experience was that the PRRI students were extremely aggressive in their lobbying for SynBio and did not respect the code of conduct that is in place at UN conference. An unusual development in these often tumultuous events saw the Honduran delegate and PRRI ally Maria Mercedes Roca de-badged (ie having her accreditation to participate in the conference withdrawn) after several serious shows of aggressive and bad personal behaviour – a very rare event in the history of the CBD. As reported by TWN, African countries in particular, led by Mauritania and Uganda, “fought an uphill battle” to have the Guidance endorsed, as well as to continue the AHTEG in order for it to develop further specific guidance. When the 8th Meeting of the Parties to the Cargagena Protocol came to a close after two weeks of often contested and difficult negotiations, the dramatic outcome was that there was no consensus for the endorsement of the Guidance, and not even for a continued mandate for the risk assessment working group (AHTEG): thus the group was dissolved. According to Third World Network, the derailing of the risk assessment working group means that “any further specific risk assessment guidance will only be available, if at all, in another four years or more”. In order for the risk assessment work to reboot, a decision will have to be taken by the Parties to set up a new AHTEG working group. That battle will take place at the next COP-MOP in December 2018 in Egypt, and the discussion will begin at the meetings in July. If this new working group decides to produce new guidance this will only be ready in 2020 at the earliest. In an area where technology keeps changing and developing at such a rapid pace, this is a major setback for the protection of biodiversity and food safety from potential adverse effects. The “signs of change” PRRI was happy to see included no decisions in favour of blanket bans on gene drives, more trouble for the UN Guidance on risk assessment with it not officially endorsed but only ‘taken note of’, and for the time being, no further guidance for new topics like SynBio. PRRI analysed its own strengths while participating in Cancún as being the mobilisation of a diversity of organisations, and being numerous. “During the first 10 days, we had at any given moment around 50 scientists in the negotiations and side events, allowing us to have eyes and ears in every forum”. Importantly, PRRI believed that the presence of young people could change the perception among delegates and show “that biotechnologies are not solely being developed by big corporations”. In addition to the student-lobbyists, PRRI also planned to bring “a delegation of innovation oriented farmers to participate in COPMOP2018”. This would be done in association with ISAAA and the European ‘Farmers-Scientists Network’.46 This network is run by InnoPlanta, a German organisation which aims to promote the development of plant biotechnology and its acceptance in society. Finally PRRI said it was planning to reach out to environmental organisations that seem open to a “balanced approach toward biotechnology” and start a dialogue. One potential organisation named is the Environment Defense Fund.47 But PRRI indicated that it needed funding for these plans, noting that “we very much look forward to your suggestions for potential donors”. In Montreal in July 2018, the CBD Subsidiary Body on Implementation (SBI) meeting will discuss the issue of conflicts of interest triggered by the Gene Drive Files. The CBD Secretariat has made proposals on conflicts of interest for this meeting, an issue that according to the Secretariat “has become important in the past few years in the context of improving the effectiveness of the work of technical expert groups”. The Secretariat has taken an important and welcome step forward by proposing a more formal procedure for avoiding and managing conflicts of interest. Anyone nominated to be part an expert group “should be required to declare any interests […] that could constitute a real or potential conflict with respect to the expert’s responsibility as a member of the expert group”. However, the proposals so far only address potential conflicts of interest in expert groups. Yet, as this article shows, the influence of industry-friendly groups such as PRRI and the Emerging Ag-network and their associated negotiators extends also to online discussions forums that are convened by the CBD and its Protocols. Due consideration should be extended to these processes as well, to ensure that at the very least, there is a procedure for disclosure of interest for participants of such online forums. Many national governments also have their own codes of conduct for their staff. The Dutch code of conduct for government officials, for instance, states that citizens must be able to trust that the government is unbiased and that decisions are made on objective grounds. It also states the obvious fact that the public interest is paramount to public decision making. Corporate Europe Observatory believes that officials whose job is to regulate certain products in order to protect the environment and food safety should not be closely collaborating with companies that have a commercial stake in such products. Corporate Europe Observatory has asked the Dutch Ministry of Health whether they consider their code of conduct to have been breached in this case. Having failed to persuade large parts of the world to adopt GMOs some twenty years ago, the promoters of the new genetic engineering techniques have increased and strengthened their efforts to break through this time, by insisting on de-regulation. At the international level the CBD with its Cartagena Protocol is the key convention for this battle. The EU, that following the ECJ ruling will be taking decisions on the legal status of gene editing and other new techniques, is bound by these international agreements and should ensure its internal positions are guided only by the public interest. The released emails demonstrate how a small group of “like-minded” officials of a few countries teamed up with the biotech industry and its advocates in order to influence the outcome of UN biosafety talks. This is unacceptable. With the rapid pace of development of new genetic engineering techniques including SynBio and gene drives, it is crucially important to have internationally agreed binding rules to counter any potential damage to biodiversity or risk for food safety. Developments in these fields are happening far faster than society’s capacity to assess the risks and the socio-economic impacts of these technologies. The Cartagena Protocol and the Convention are essential in examining these techniques closely and in ensuring that biological diversity as well as society, in particular Indigenous Peoples and local communities, are not adversely affected by the premature deployment of the new techniques.